Should it be 'Axed' ? For many of us this is a question that has come up in the past, or maybe it is an issue right now. Deciding whether to cut down a tree is an important decision for property owners and shouldn’t be taken lightly. Once a tree is felled it is most likely irreplaceable. First I would suggest working out the following questions to form a Pro’s and Con’s list. This is a very basic way to decide your course of action. 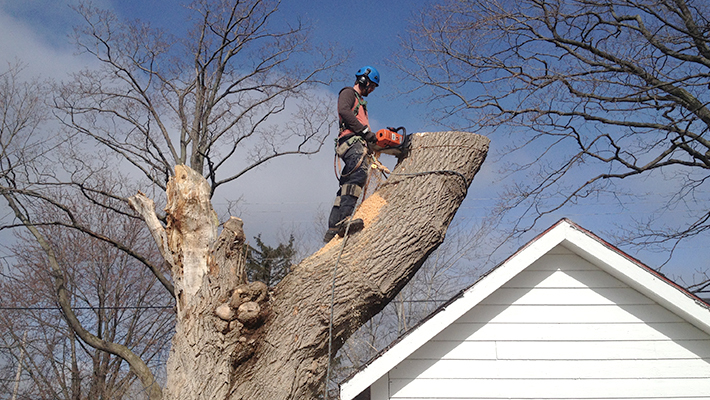 It is important to hire or consult with a Certified Arborist before proceeding to do/have the actual work done. #1. Is the tree a desirable species? This might seem like a simple question, but none the less it is still valid. All species are different and each is suited to a different environment. Some aspects to consider are as follows. What is the strength of the wood? Are there any serious pests that affect the tree? Does it drop a lot of debris? Is the root system deep or shallow? What is the estimated size the tree will reach? Is it an invasive species? #2. How healthy is the tree? Another important thing to consider. Leaving a tree in decline can create a dangerous and costly issue in the future. Determining the health of a tree should be left to a professional Certified Arborist. They will be able to verify the condition of the tree and provide a course of action. As a homeowner, watch the top of the canopy. If your tree begins to die from the top down a consultation is warranted. Also previous work done on a tree can have adverse effects many years down the road. “Topping” or the drastic reduction in height leads to weakened new growth resulting in breakage. A professional should have an idea of previous work by looking at the current canopy. #3. Is there trunk damage? Watching for splits, cracks and hollows in the trunk of your tree is very important. These usually point to a weak area and internal decay. Also fungus on the bark or near the trunk can be a sign of rot. If any of these symptoms are visible they should be evaluated by a professional. #4. Has there been excavating near the tree causing root damage? If 50% or more of the root plate has been damaged the tree should probably be removed. Also trees that have been buried by any more than 8 cm of soil will likely begin a gradual decline. However if this is caught early enough, before the signs of stress begin to show many can be saved. #5. Is the tree leaning? This can be a serious issue. While some trees simply grow on a lean and strengthen themselves to support their canopies, ones that suddenly develop a lean should be evaluated by a professional. This can be a sign of weakening or damaged roots and should most likely be removed. These are some simple ways to do a self-evaluation of your trees. There are other factors to consider that are site specific and can be explained by a Certified Arborist. Having a professional opinion can potentially give a preservation option that allows to tree to remain safe and standing. Many goals can be reached through pruning, support systems and some preventative measures. Also you can rest assured that the right decision was made one way or the other.